You do get a lot of free advice on everything under the sun. Point is, one is not able to distinguish which advice has some ulterior motive and which advice is really meaningful advice. The problem is acute especially when the subject matter of the advice is unknown – like in the case of the doctor’s advice. That is why many do seek a second opinion. If that is happening even in the case of paid advice like a doctor’s, the confusion which people have when they receive free advice is several times more. Don’t look the gift horse in it’s mouth is a popular saying indicating that if you have got it for free, you have to be grateful to accept it without any underlying conditions. Free advice is something like that. Since you are getting it for free, you will not be able to pin down the person giving advice, should it turn out to be wrong. Forget about pinning down, you can’t even complain. Like it happens to those who go to a chemist and ask for medicine for stomach ache… or those who go to a computer shop and ask for advice as to which computer/ other hardware to buy. Free advice, ironically, is seldom free. The one giving advice normally wants something from you – whether it is a beauty / health consultant or Insurance agent… the former wants to push some cosmetics / health supplements and the latter some policies and their “advice” is tailored towards hectoring the client in that direction. From their point, the success of their advice, is in how many jars/ bottles of creams and powders they have sold or how many policies and what premium they were able to wangle out. The cost of their advice is hence coming from the products sold. It is anything but free. As can be seen, if the advice has been made with the intention of pushing a particular product because it is remunerative to the seller, it has serious implications for the buyer. More so, if the product in question is partially suitable or wholly unsuitable. We do not have a culture of paying for advice and in almost every case we look for advice from the person who is the seller too! There is an inherent conflict of interest and we seem to be fine with that. Seeking the advice from the wrong person ensures that the end result is a catastrophe. And yet people are averse to paying for advice. World over there are those who offer advice for everything from planning weddings to funerals, landscaping one’s lawn to planning birthday parties. I just read recently there are even divorce planners who ensure that the somber mood on the divorce day is captured and the “invited guests” present on that day, are well taken care of! The aversion to pay for services is somewhat surprising considering that our country itself is thriving due to a vibrant services economy! We are offering back-office processing services to the world. We offer knowledge services like design, legal, financial services internationally. Our IT sector is the toast of the world for Global Service delivery. Lakhs of people are employed in these sectors. Jobs have shifted to India and other countries for such work as they find that it is cost effective to get this work done in this part of the world – with same or better efficiency that they could get there, at lower cost. Most people do not have the time, inclination or the knowledge to do the due diligence before committing their money in various financial instruments. They would know much less about whether what they are doing would help them to meet their goals or how much money would actually be required to be saved in what instruments, to achieve their goals. Asset allocation, Risk management, cashflow management etc. may not be their forte as well. Since it is pretty clear that these concepts are alien to most investors, would it not make sense to involve a professional to advice them regarding their finances? There are investment advisors and wealth managers who will do this for a fee. 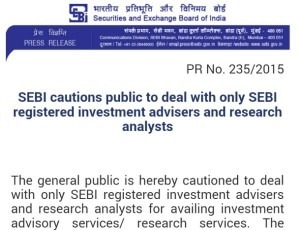 Investors are advised to find out how competent they are in advising them, whether they are attached to any institution which restricts their product choices to the ones dictated by their company and whether they deal in the entire range of products that would be relevant to an investor. Better than just investments alone, many may want a personal blueprint to achieve their unique & specific goals. That may call for engaging a financial planner. They would be able to tell you whether you are currently on-track, the way forward and what you need to do to reach your goals. They would go through all investments/ insurances you have ever done in the past and would be able to advice you holistically on what you need to do. Check if they are independent. Check their education, experience in this profession and also seek some referrals. Check a sample plan. After doing all this, you will get a sense of whether they would be able to add value to you or not. But, even if they advice you against investing in one inappropriate plan & stop you from it, you would save tens of thousands of rupees. Appropriate cash management can maximize the returns even while helping you meet liquidity or short-term goals. You would earn even more when they suggest good investment candidates and are able to manage your investments as well. That costs money ofcourse – but free advice is costlier! « Special Children- How to Create a Financial Plan?